Life, Doctor Who & Combom: New Doctor Who Matt Smith and Jenna-Louise Coleman Image revealed! New Doctor Who Matt Smith and Jenna-Louise Coleman Image revealed! The Official BBC Doctor Who Website has revealed a new on-set photograph featuring Matt Smith and new Companion - Jenna-Louise Coleman. 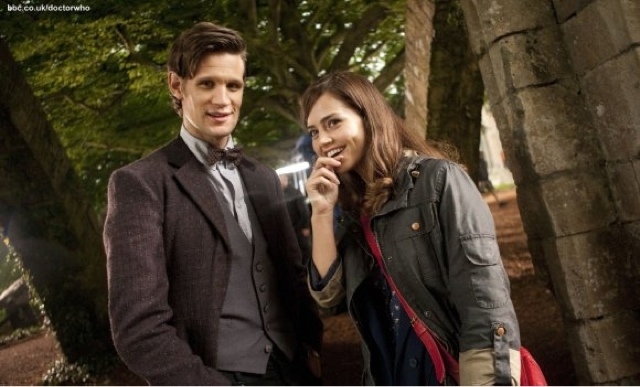 The official website will be revealing more images of Matt and Jenna over the next week. Ooh, it looks the the Doctor haas a new look, I wonder if it's just for the Chritmas special or for the rest of the season too? The episode being filmed in this picture is episode 11, they'll be filming the Christmas special later on - I think he'll get the new costume from the christmas special Onwards though. I'm liking the Doctor's new look! Perhaps he's wearing darker colours because he's in mourning. Could this Rory/Amy death rumour be true?